Socrates couldn’t have been more right when he said: “I know one thing, that I know nothing.” Even with all of the advancements we, as a species, have made in this world, it’s still nothing compared to countless of wonders waiting to be discovered in the vast universe. If you’ve recently developed an interest in astronomy and stargazing but don’t know whether you are serious enough to actually pursue such an endeavor, the best thing for you to do is get an affordable telescope and try to peer into the vast cosmos yourself to find out whether this is actually something you would want to do in the long-run. There are a number of budget-friendly telescopes out there that are perfect for viewing planets and we’ve rounded up five of the best to help you start your journey into the vastness of the outer space. They say that the ideal price range for affordable telescopes is between $100 and $250 and if that’s the case, then the Orion SkyQuest XT4.5 Classic Dobsonian telescope definitely still fits the bill. At $250, this reflector telescope is considered an ideal instrument for beginners. 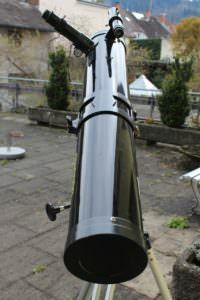 The Orion SkyQuest XT4.5 Classic Dobsonian features a 4.5-inch aperture, an f/8 focal ratio, and a focal length of 900mm. This allows the telescope to provide exceptional views of the moon’s craters, valleys, and mountains along with Jupiter’s cloud band stripes and closest Galilean moons as well as Saturn and its famous rings. Furthermore, the SkyQuest XT4.5 Classic Dob is not limited to our solar system alone because it can reach deep into the Milky Way galaxy and peer into its star clusters and nebulae. Besides its optical capability, this telescope’s size and design make it highly portable and family-friendly – making stargazing a fun and easy activity. If you’re all about simplicity, then the Meade Instruments Infinity 102mm AZ refractor telescope may impress you. Like the SkyQuest XT4.5, this refractor telescope is a great tool for beginners. As far as optics go, the Infinity 102 definitely excels beyond an entry-level telescope, having a 4-inch aperture, 600mm focal length, and a f/5.9 focal ratio. While this telescope excels at low power, it also has a dual use for daytime terrestrial viewing. In addition to that, the Infinity 102 also comes with three eyepieces: a 26mm, a 9mm, and 6.3mm providing a magnification of 23x, 67x, and 95x respectively. What’s more is that it also has a 2x Barlow lens which doubles the magnification of the eyepieces. The Infinity 102 also has an Altazimuth tripod and mount which makes it easier to set up and use. Because it is a refractor telescope, don’t expect to get any decent views of deep space objects from this instrument. However, you do get to enjoy greatly-detailed images of the moon and our neighboring planets. This telescope is priced at $202. The Celestron AstroMaster 114EQ is all about quality and affordability. Boasting a 114mm aperture and 1000mm focal length, this reflector telescope is able to view in great detail the moon, our neighboring planets like Jupiter, Saturn, Venus, and Mars, as well as some deep-space objects. To add to the telescope’s optics, the AstroMaster 114EQ also comes with two eyepieces: a 20mm eyepiece which provides 50x magnification and a 10mm one that enables 100x magnification. Its Equatorial-type mount is being praised for its quality and sturdiness. Furthermore, it seems like the telescope has been well-constructed by the manufacturers – making use of high-quality materials such as durable steel and aluminum. The AstroMaster 114EQ is priced at $170 and if you purchase this telescope, you would also get the Celestron’s planetarium software called “SkyX” which contains information on about 10,000 celestial objects. You can never go wrong with the Celestron PowerSeeker 127EQ. This telescope is designed to be affordable and usable at the same time. What can be said about this scope is that it is one of the most popular telescopes in the market today due in part to its cheap price of $150. But the PowerSeeker 127EQ is not just about affordability. In fact, it has quite impressive optical capabilities for its price, having a 127mm aperture, 1000m focal length, 300x maximum useful magnification, and 329x light-gathering power. Furthermore, this telescope comes with three different lenses consisting of a 4mm, a 20mm, and 3x Barlow lens that would triple the magnification of the two lenses. It has an equatorial mount and tripod that is easy enough to set-up without any challenges. With the PowerSeeker 127EQ, you would be able to bask in the wonderful view of the moon, the nearby planets as well as some objects in deep space. If you want to get a budget-friendly telescope with good features, then the PowerSeeker 127EQ is definitely the telescope for you. Last on this list is also the most affordable telescope. It is recommended that buyers should avoid telescopes priced below $100 due to their faulty nature and the lack of guarantee that they would produce satisfying viewing results. However, there are exemptions to this and a good example of that is the AstroMaster 70AZ. Priced at only $99, the Celestron AstroMaster 70AZ refractor telescope is considered to be the best tool for beginners due to it being easy to use and assemble. Its 3-inch aperture, 150mm focal length, and 165x magnification allow detailed views of the moon and our neighboring planets. This telescope also comes with two eyepieces (20mm and 10mm) as well as three coated lenses to resolve focusing issues. Unfortunately, since it is a refractor, it’s not powerful enough for deep-space viewing. For squillion of years the sun has been supplier of solar and thermal energy. Save our planet. Building a peaceful and sustainable world. Energy resources are fast depleting, we should work towards their conservation.